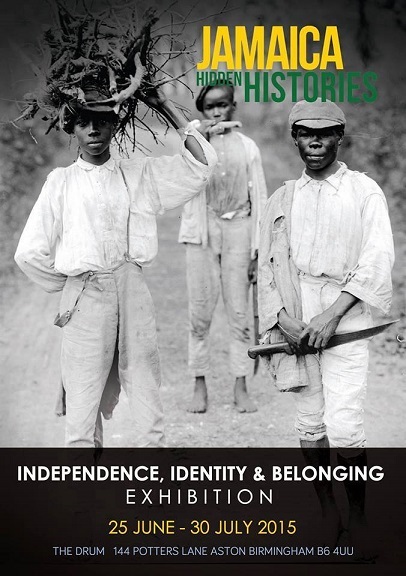 Full Spectrum Productions presents the Jamaica Hidden Histories Exhibition: Independence, Identity and Belonging at The Drum, Birmingham (UK)—the exhibition is free and open to the public. It opened on June 25, 2015, and will be on view until July 30, 2015. This is the culmination of a two-year project that uncovers and showcases cultural and historical links between Britain and Jamaica, and forms part of a UK gallery tour. [Curated by Jamaican-born, UK-based Lorna Holder, the exhibition was previously on view at gallery@oxo, Oxo Tower Wharf, London (UK) until May 17, 2015. See previous post Art Exhibition: Varala Maraj Reviews “Jamaica Hidden Histories”. ]The Drum is located at 144 Potters Lane, Aston, Birmingham, and is open Mondays to Saturdays – 10:00am-6:00pm.